Make your next movie night magical! 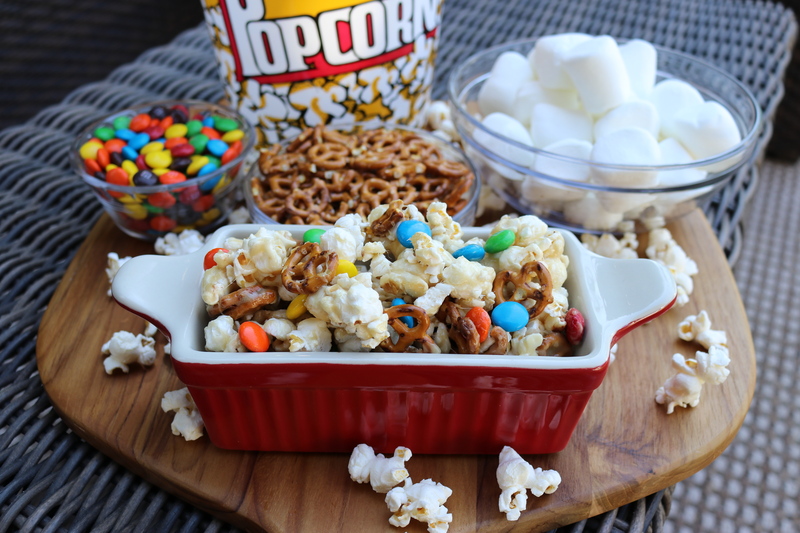 Popcorn mixed with marshmallow, caramel and topped with M & Ms! Be warned...this gooey treat is hard to put down! 1. Make popcorn. Spread half of the popcorn and pretzels on one of two parchment lined (or Silpat lined) baking sheets. Set aside. 2. Melt butter over medium heat in a medium saucepan. 3. Add the brown sugar and corn syrup. Stir until mixture starts to boil. 4. Turn stove to medium-low and add the marshmallows. Stir until marshmallows are completely melted. Remove from heat and add vanilla. 5. Pour the marshmallow mixture evenly between both baking sheets and stir until all the popcorn and pretzels are coated. 6. Add M&Ms and continue to stir. You can use your hands if needed. Just spray your hands with cooking spray and gently fold the popcorn mixture until all M&Ms are distributed evenly. 7. Sprinkle with sea salt and serve. Popcorn will keep for serval days in Tupperware. Make popcorn. Spread half of the popcorn and pretzels on one of two parchment lined (or Silpat lined) baking sheets. Set aside. Melt butter over medium heat in a medium saucepan. Add the brown sugar and corn syrup. Stir until mixture starts to boil. Turn stove to medium-low and add the marshmallows. Stir until marshmallows are completely melted. Remove from heat and add vanilla. 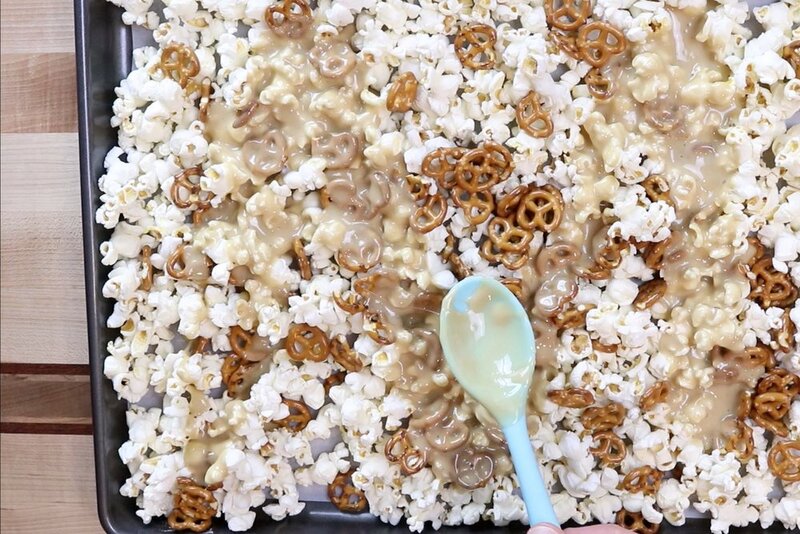 Pour the marshmallow mixture evenly between both baking sheets and stir until all the popcorn and pretzels are coated. Add M&Ms and continue to stir. You can use your hands if needed. Just spray your hands with cooking spray and gently fold the popcorn mixture until all M&Ms are distributed evenly. Sprinkle with sea salt and serve. Popcorn will keep for serval days in Tupperware. I use a Stir Crazy popcorn maker, but you can make your popcorn any way you choose.